Select your complete music production and recording package. The Alesis Q49 has emerged as a preferred medium-format MIDI controller. Alesis’ build quality and smart design has kept the Q49 as one to consider in this popular category for contemporary music producers. It is available here in special packages that feature the Q49. The Alesis Q49 is a 49-note, velocity-sensitive, MIDI keyboard controller with USB and traditional MIDI ports that enable you to connect to almost all MIDI equipment including software and sound modules. Thanks to Pitch and Modulation wheels, backlit Octave Up and Down buttons, and a Volume/Data Entry slider, you can add expression, range, and dynamics to your performances quickly and effortlessly. The Virtual Instrument Collection is the work of 11 of the world's most innovative music technology companies. It is an outstanding collection of software tools you need to make music quickly and efficiently with top-quality audio results. This collection offers a vast and inspiring array of virtual instruments including analog synths, pianos, drums, sound effects and even cloud storage. Best of all, this collection offers all these tools at an unbelievable, working-musician price. The Recording Software Collection is the work of 8 of the world's most innovative music technology companies. It is an outstanding collection of software tools you need to record quickly and efficiently with top-quality audio results. This collection offers a vast and inspiring array of Recording, Mixing and Mastering Effects, including Tutorials and an award-winning professional DAW. Best of all, the Recording Software Collection offers all these tools at an unbelievable, working-musician price. Studio One 3 is instantly familiar—yet nothing feels like it. It contains everything you’d expect from a modern digital audio workstation, with a fast, flow-oriented, drag-and-drop interface that was built by creative people for creative music production. At every step of the musical process, you’ll spend your time creating music instead of fighting an overly complicated interface. The XCHANGE Recording Software Collection includes Studio One 2.0, so you will be up-to-date with the latest version. The Recording Software Collection is the work of 11 of the world's most innovative music technology companies. It is an outstanding collection of software tools to produce beats, tracks and albums with top-quality audio results. This collection offers a vast and inspiring array of Recording, Mixing and Mastering Effects, including Virtual Instruments, Drum software and an award-winning professional DAW. Best of all, this collection offers all these tools at an unbelievable, working-musician price. The Sterling MX5 bi-amped studio monitor represents the latest evolution in Sterling Audio design, combining top sound quality with next-generation materials that deliver top-class audio quality and features. With dual-axis WaveGuidanceVH™ technology each bi-amped monitor is built for optimal wider-and-higher frequency dispersion, giving you clear, articulate sound even when listening off-axis. Secure, reliable, professional quality TRS cable. Livewire Advantage Series represents ruggedness and reliability without compromises in clarity and detail for studio, stage or broadcast. 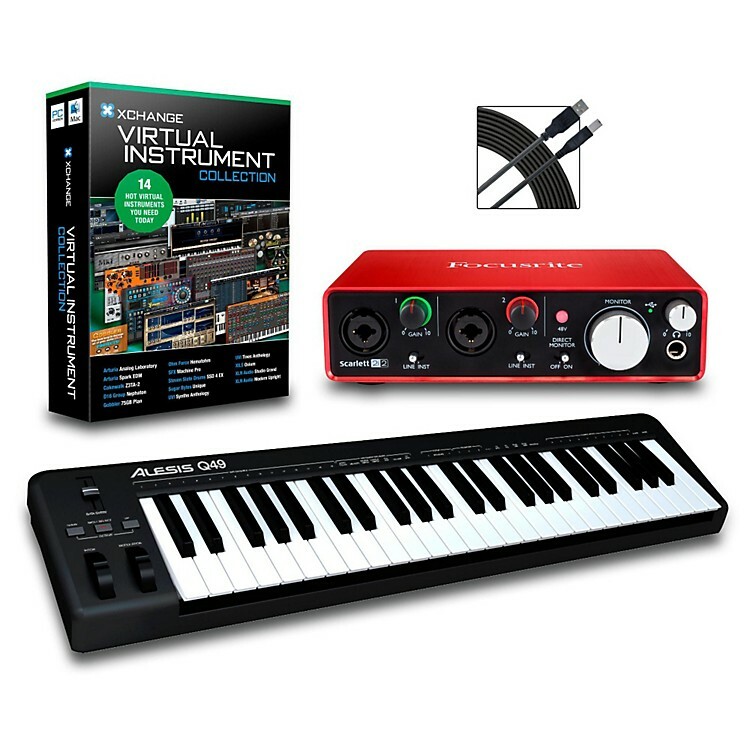 Virtual instruments packages, recording packages, production packages. They're all here. Order today.